Rev. Arthur Thomas Gerald, Jr.
Arthur T. Gerald, Jr. was born in Boston. He is the only son of his beloved parents the late Arthur and Sarah Gerald. Arthur was blessed with four sisters Margaret, Gwendolyn, Lucille, and Jeannette whom he loves dearly. In the late fifties, when “Turk” became a teenager, he came under the influence of the social work ministry of Rev. Michael E. Haynes, who was then youth director of Norfolk House Centre of Roxbury. Graduating from Boston English High, he attended Lincoln University in Pennsylvania. He later transferred to Berkshire Christian College in Lenox, Massachusetts. He was ordained as a minister of the gospel of Jesus Christ in 1976 under the pastorate of Dr. Michael E. Haynes and became active in Twelfth’s College Ministry Outreach. During his graduate program at Gordon-Conwell Theological Seminary, Rev. Gerald was called to Twelfth Baptist Church’s ministerial support team as well as to serve as Minister to College Students and Young Adults. In the seventies, he had the opportunity to serve with Dr. Haynes in the Massachusetts House of Representatives and credits his development of strong managerial skills and keen sense of politics to that experience and exposure. Rev. Gerald recently retired from Salem State College in Salem, Massachusetts as Associate Dean of Students and Director of Multicultrual Affairs where he dedicated 38 years of exceptional academic support. In 1979, Rev. Gerald married Sister Henrietta Williams of Mattapan. She is a graduate of Salem State College and works as a flight attendant for American Airlines. God has blessed them with two children Arthur-Michael Gerald, a graduate of Salem State College currently working in the banking industry, and Alana-Michelle Gerald, a rising pre-med senior at Spelman College in Atlanta, Georgia. During his tenure on TBC’s ministerial staff and later as Associate Minister, Rev. Gerald has been actively involved in Christian Education, sewing as Dean of the School of the Bible. He also served on the Missions Ministry. His gifts in the area of committed stewardship of Finance and budgeting has made him valuable with the administration of this church and its Budget and Nominating ministries. For the past several years Rev. Gerald has also served as Chairperson of the Preschool Directorate Board and Chair of the church’s Human Resource Committee. 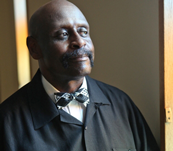 Reverend Gerald has won numerous honors in the community and in the academic world. He has been appointed to serve on several prominent educational and community boards of distinction. Arthur has cruised and traveled extensively including an intensive study tour with Dr. Haynes to the American Baptist mission stations in Africa. A highly sought after college basketball player, he now spends leisure time keeping abreast of the sports world. Arthur is a humble, strong, quiet, faithful, and ardent minister of his Lord Jesus Christ —continuing to seek God’s Will, grow in wisdom, and to develop as a dynamic preacher, counselor, and educator. His life Bible verse is found in Joshua 24:15 … but as for me and my house, we will serve the Lord. On Sunday, March 21, 2010, Arthur T. Gerald, Jr. became Pastor-Elect of Twelfth Baptist Church, after serving as Interim Pastor for nearly six years. This day, Sunday, June 27, in the year of our Lord 2010, he became the thirteenth pastor of historic Twelfth Baptist Church.